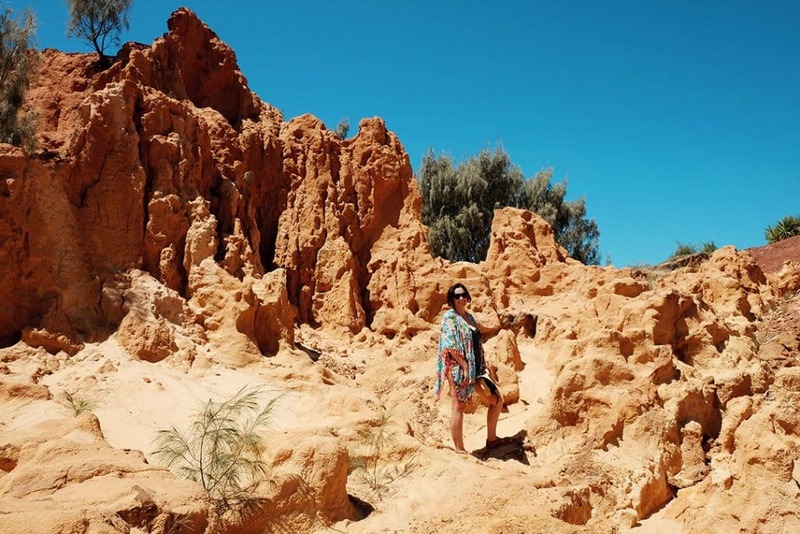 An Adventure of a Lifetime on Moreton Island | Plus a Pretty Special Moment!! 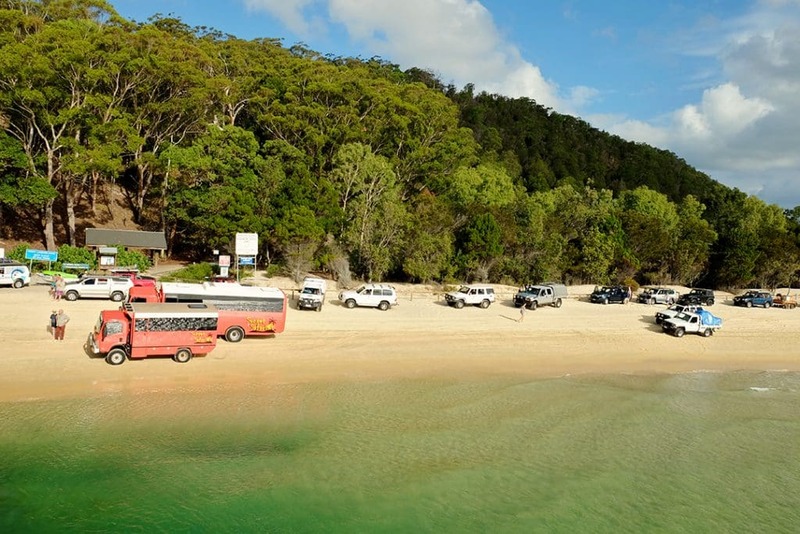 Want to go on a Moreton Island Tour to the third largest sand island in the world? Have you ever wanted to 4 wheel drive on a sandy beach highway? Join in on the fun and spend your next adventure filled holiday on the amazing Moreton Island in sunny Queensland, Australia! If you don’t, you will be missing out some incredible Moreton Island adventures! Let me tell you why! 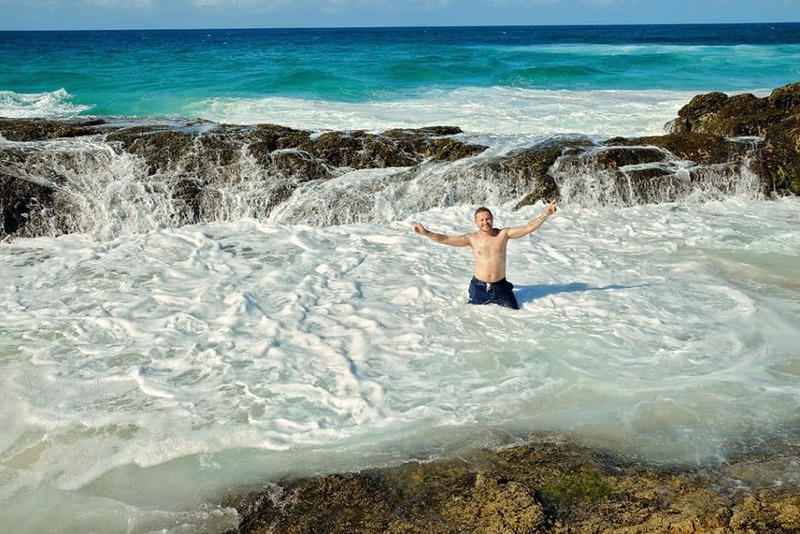 If you are not afraid of getting a little wet and sandy, then this adventure will blow your mind! Even after spending two amazing days on the island, there was even more of Moreton Island to be discovered. However, the best way to see the most popular spots on the island, in a short period, is with an experienced guide that knows the ins-and-outs of the island! We went on an Experience Oz 2 day Moreton Island adventure with Sunset Safaris and we loved every minute of it! 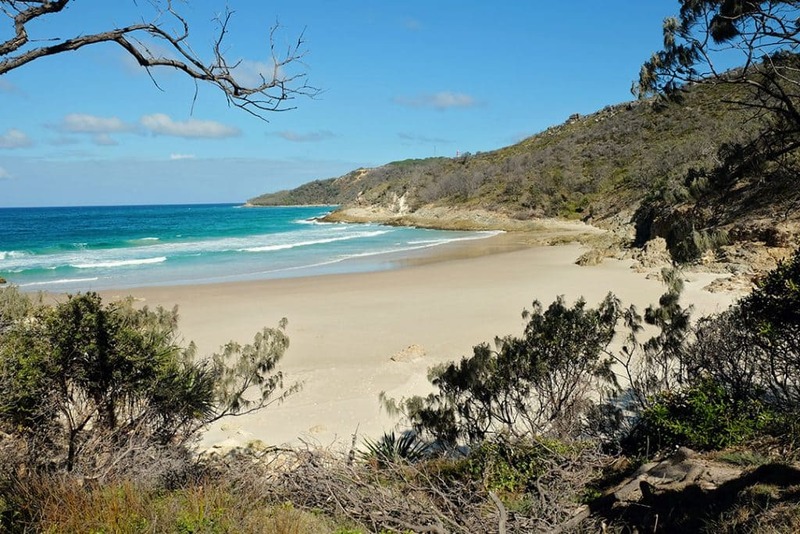 Where is Moreton Island and How do you get there? 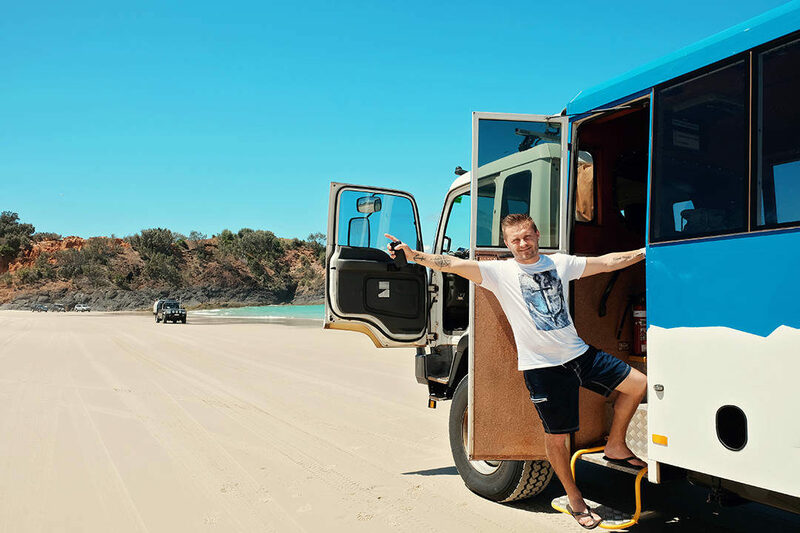 The Moreton Island adventures start as soon as you get to the island and your feet step onto the soft sandy beach! 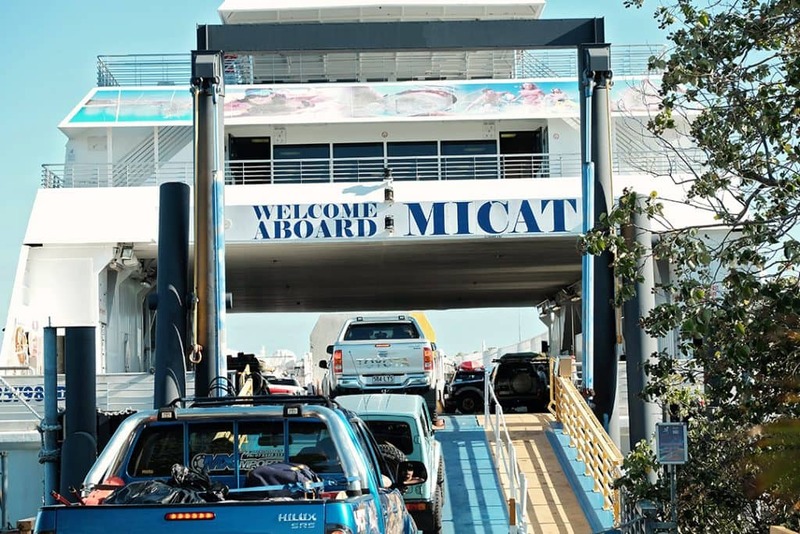 To get to the island, you need to catch a MiCat Ferry from the Port of Brisbane. The trip will take you approximately 1.5hrs. Whilst you enjoy a brekky or early lunch, you will be able to enjoy the views of the beautiful Moreton Island Bay. All from a fully air-conditioned main deck, or from the open-deck upper level. Tip: The ferry across may feel a little long, so if you don’t feel like small talk or chatting with your friends (haha…), we would recommend to take something with you to amuse yourself; eg: phone, book or playing cards. 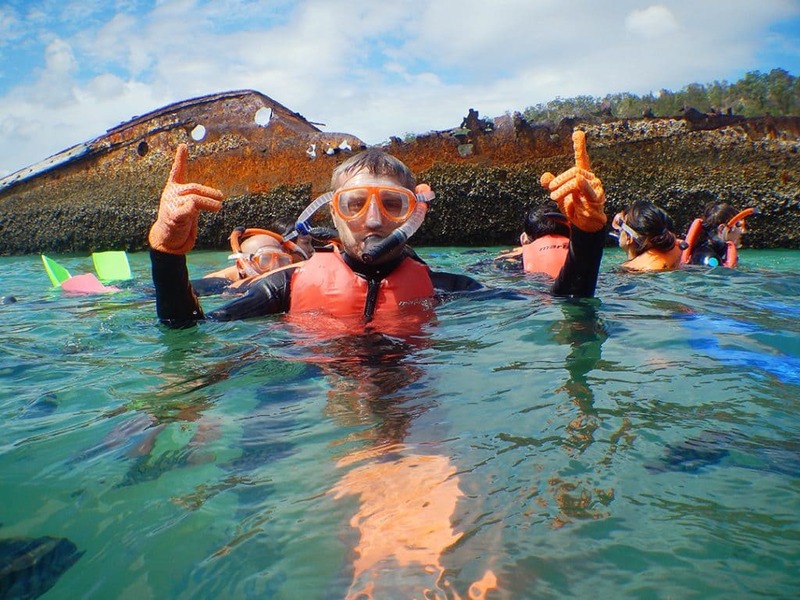 Snorkelling amongst the Moreton Island shipwrecks is a number one on the list of things to do on Moreton Island! I don’t know about you, but for me that was definitely the highlight of the trip, for sure! There are 15 sunken ships on the island, but the Tangalooma shipwrecks are the best! Once we were fully geared up with swimsuits, flippers, snorkelling goggles and a swimming vest, we were ready to go. They even gave us gloves for protection and we quickly learnt why! As you make your way between the shipwrecks, the rusty, weathered walls of the ships pop up everywhere. It’s best to have gloves on, so you don’t hurt yourself on the walls of the ships. There are plenty of fish all around you, and guess what? These little suckers were nibbling on us a bit. Especially on the fingers of the gloves as we tried to touch them! Were they piranhas? Haha.. No!! It’s all safe here! We love snorkelling! It is always a great adventure to enter the underwater world and spend a bit of time with the monsters beneath! Haha… The fish were not that big, and we also managed to spot a funky coloured shark sleeping in between the crevasses of one of the shipwrecks. Couldn’t get a perfect photo though, because the water wasn’t that clear that day! Still, it was awesome to see one up close! Apart from snorkelling, you can also get into one of the transparent kayaks available. Now, that is another way to check out the underwater wildlife and get another perspective on the awesome shipwrecks! 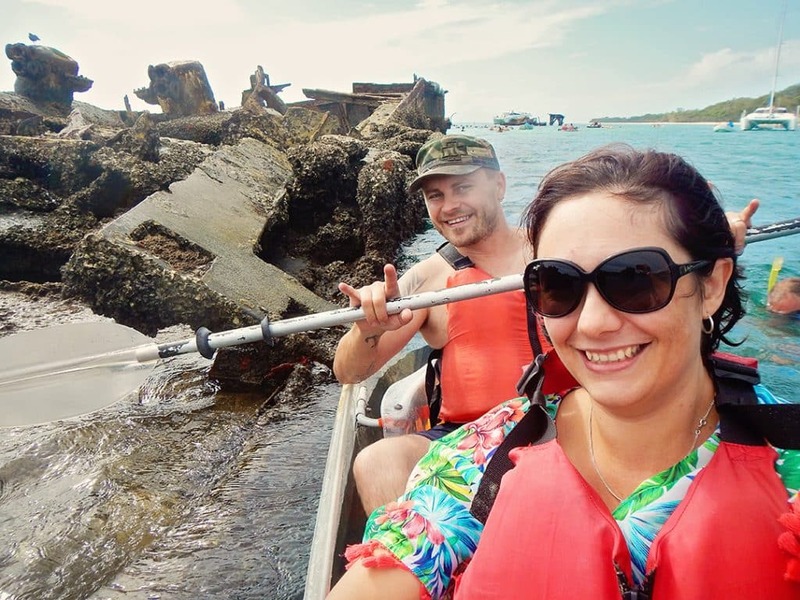 I love kayaking, and to top it off, kayaking in between the shipwrecks was double the fun! It was better than awesome! 4 Wheel driving on the sand island is awesome! And I wasn’t the only one having a great time driving through the sandy trails of the island! None the less, 4 wheel driving on Moreton Island was awesome and I definitely recommend it! Ps: Whilst you are enjoying the 4 wheel driving, you will get hungry. Lunches are included as part of the tour, so you will be looked after here! We do recommend that you take some snacks along though! Have you ever been to a desert? I haven’t, but I think this is pretty close to a miniature one, for sure! If you remembered from the intro of our story, you will get a little sandy on the island as well. 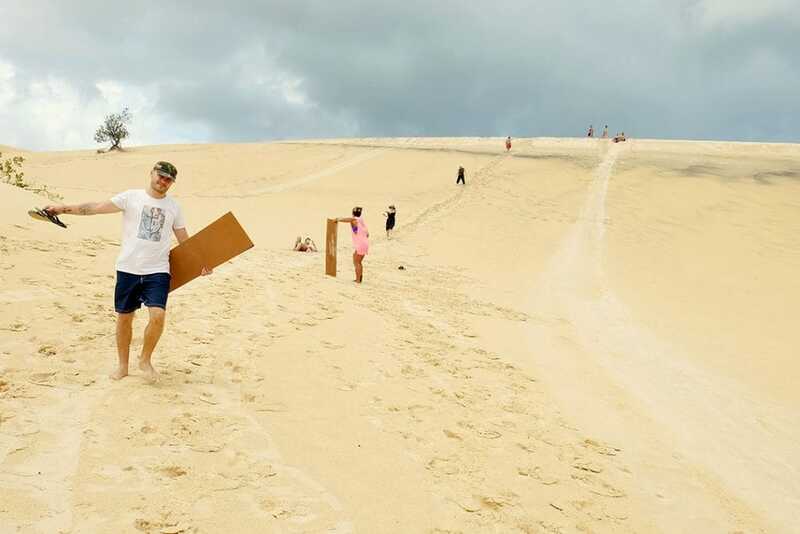 The Moreton Island sand dunes provide a Luna park for sand boarding! Obviously, you have to be a responsible traveller and minimise the disturbance to the sand dunes, by keeping your tracks to one line and not run around like crazy all over the shop. Sand tobogganing was awesome!! 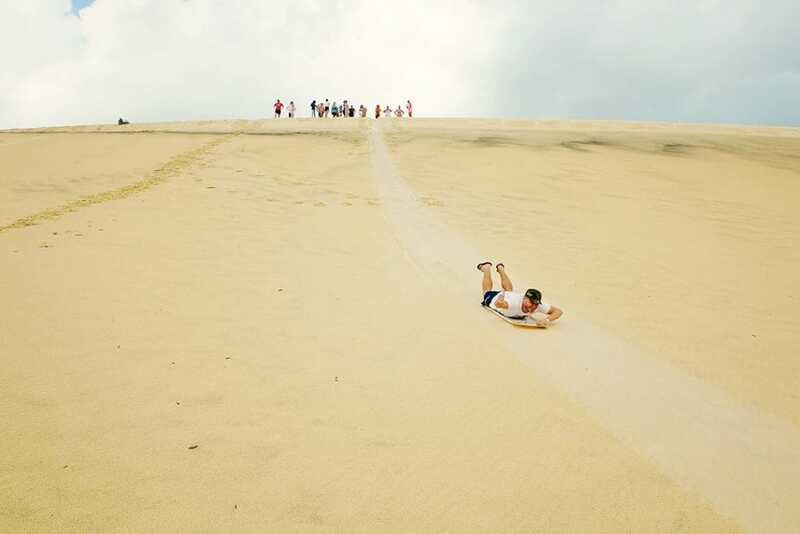 At first, I thought that I’ll be eating plenty of sand on the way down, but it was all good. It was great fun! Recommend it!! We have seen plenty of sunsets on our trips lately. I have never seen a proper sunset over the water in Australia. I have been living on the East coast of Australia for 20 years now, so chances of seeing the sunset over water are slim! Unless you venture out to an island, that is far enough away to see one! And I’m glad we did! Soft sand, love of my life next to me, pre-dinner drinks and a perfect sunset… Doesn’t get much better than that! The tour we went on, included a nice stay at the Castaways Beach Resort. There was plenty of choices of accommodation, from basic shared rooms (which are included in the 2 day tour) to glamping tents. We recommend you upgrade to a glamping tent option! That way you have a bit more privacy, your own bathroom with a shower and toilet. Whilst we stayed at the resort, we were provided with a BBQ dinner and a continental breakfast. In the evening there was a fire burning where we had a great time chatting to people from all over the world. You can always learn something new by meeting new people! We were lucky enough to see a variety of Moreton Island wildlife on our trip there. Amongst plenty of bird species, we did spot a fair few Oystercatcher Birds. These little guys spend a lot of their time on the beach in search of the pippies. I never seen pippies in their natural habitat and not on a seafood pasta dish. Naturally when asked, who wants to try this delicacy fresh from the sea, I put my hand up! Haha… Got to face my fear of food, or my food Neophobia. Yeah, I got to say, trying to eat something that is moving and hiding from your teeth, is something else! I don’t think I’ll be doing that again any time soon! Had to try it though! 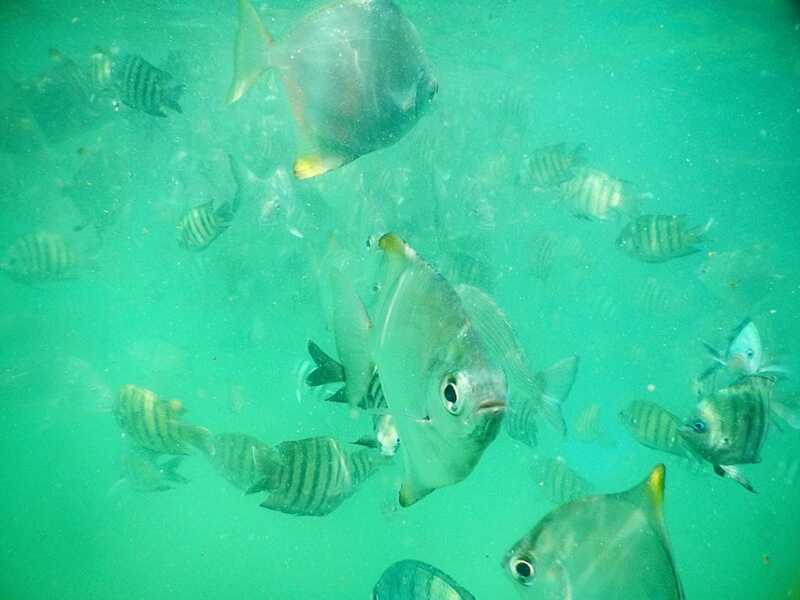 Apart from all the birds and pippies, we also saw a pod of dolphins swimming out in the surf, large turtles chilling out close to the rocky shoreline at Cape Moreton and of course plenty of colourful fish when we snorkelled! Although we had seen so many different species of wildlife at Moreton Island, there was one little creature that stole all of our hearts! Yup, call me a softie, but this little turtle was the coolest thing you ever seen! 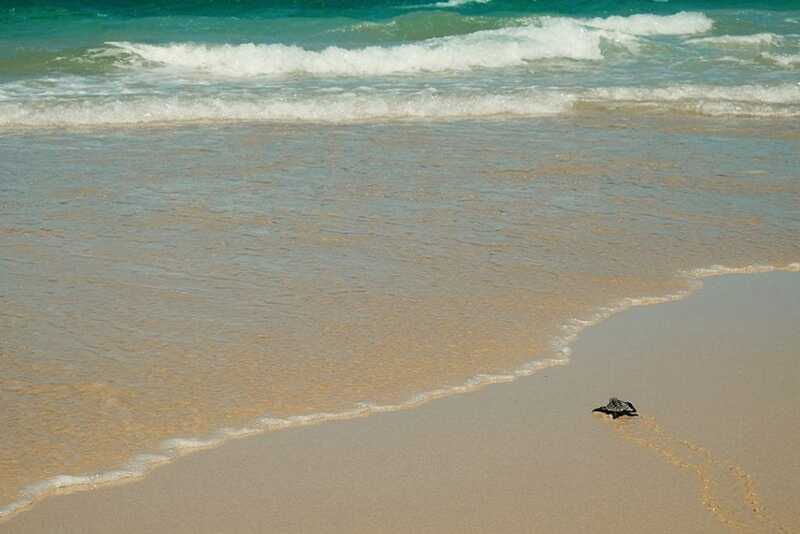 We were lucky enough to spot this little sea turtle as he made his way through the beach highway to the surf. Tell you what, it looked like a journey and a half, even without all of us staring and taking photos. Hopefully, you will be able to spot one on your trip to the island. This stop was a bit of a pleasant surprise for me! I really enjoy rugged landscapes that has so much texture and colour to them. It makes me think of my paintings. Yes, I paint as well as I blog, so does my gorgeous wife. Painting is one of my biggest passions and places like Cape Cliff simply fuels ideas in my head and inspires me to no end! Apart from that, my inner kid loves climbing around the sandstone formations, even though I was wearing thongs! There are a number of lighthouses on the island, but this one is the special one. 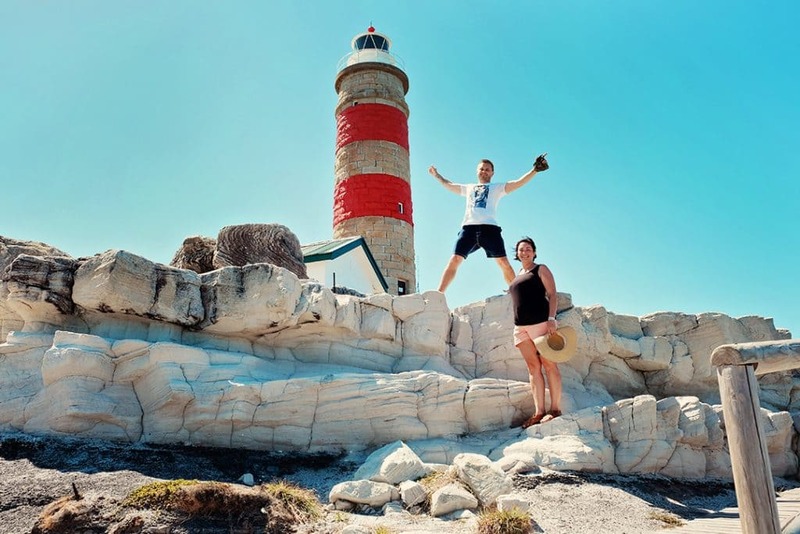 Cape Moreton Lighthouse is the oldest and the first lighthouse to be built in Queensland. It is made totally of the sandstone quarried on the island. The lighthouse is still in use and the light house keeper lives right next door. A spectacular spot for looking out onto the ocean far below. We spotted a pod of dolphins and some turtles playing in the surf below. If you don’t like a bit of romance, then leave now!! Haha… OK, OK! Stop, just joking! Essentially it is just a beautiful beach with panoramic views that has the funky name of Honeymoon Bay! You might remember a Honeymoon Bay from our previous story in Tasmania? These places were named for their secluded and gorgeous setting! These are beaches, were you can simply relax in a peaceful atmosphere with your significant other and enjoy a picnic in a sunshine! 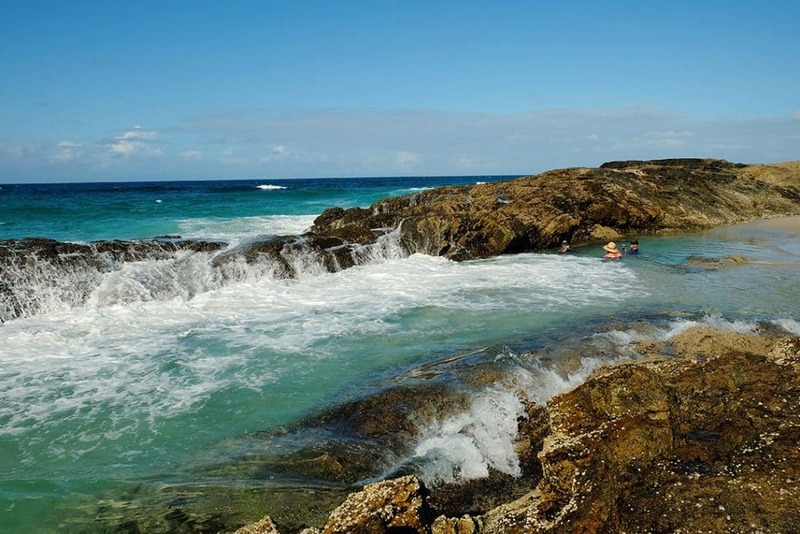 The Champagne Pools at Moreton Island is a great spot to spend an hour or two. You can chill out behind the rocky shoreline in the calm part of the pools or you can be like most people and try your luck under the tumbling, frothy water spraying over the rocks. This is a perfect place to have a bubble bath and refresh! No, you will not get a champagne on arrival here! Sorry… The name is just cause of the looks. That’s all. 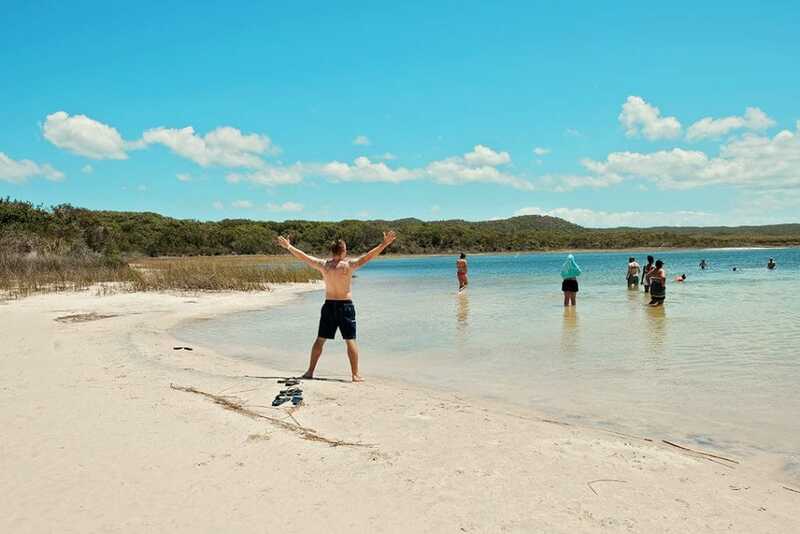 The Blue Lagoon is the largest and most popular of the fresh water lakes on Moreton Island. It is a natural fresh water lake that is infused with tea tree oils, and together with the white sand, it creates a lake with different shades of blue water. The water was shallow and very refreshing on our hot day of exploration. We didn’t spend much time here as we were on a bit of a schedule. But we managed to relax a little, have a swim in the shallow water of the lagoon, before heading back through the hot sandy trail back to the bus. you love an extraordinary gateway! Experience OZ is a one stop shop for tours, activities, theme parks and much much more. They are an Australian company and when you book this 2 day tour through them you will not be paying any extra fees. No booking fees and no credit card charges, only the best and lowest prices available! 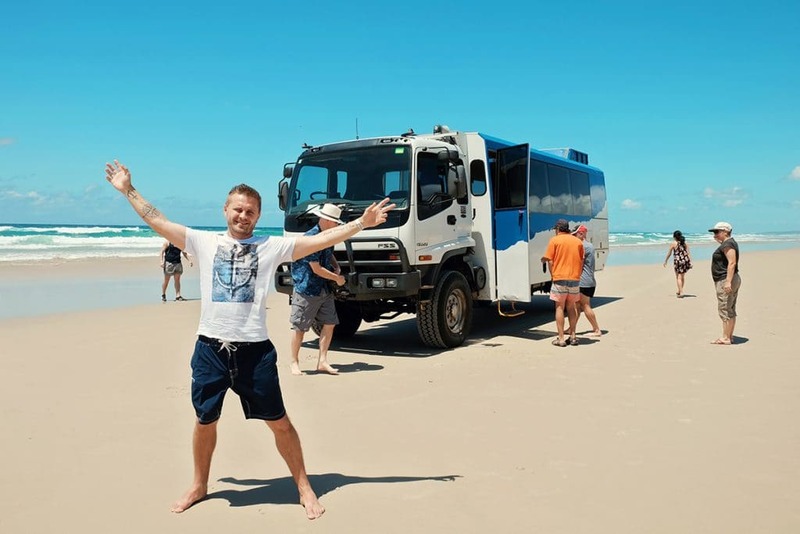 If your time is limited you can get onto a Moreton Island day trip (from Brisbane) or from the Gold Coast instead. Choice is yours! Have you been to the Number 1 Largest Sand Island in the World?? 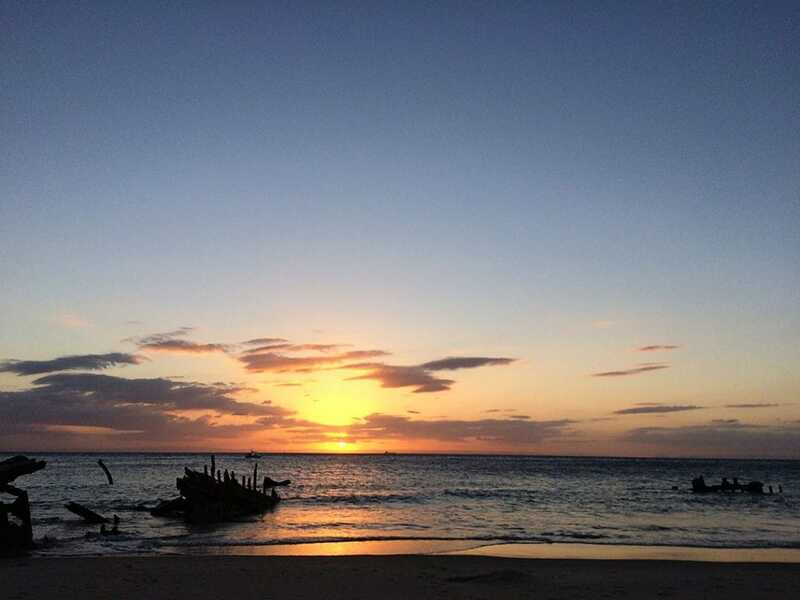 Disclaimer: We visited Moreton Island as guest of Experience OZ + NZ. 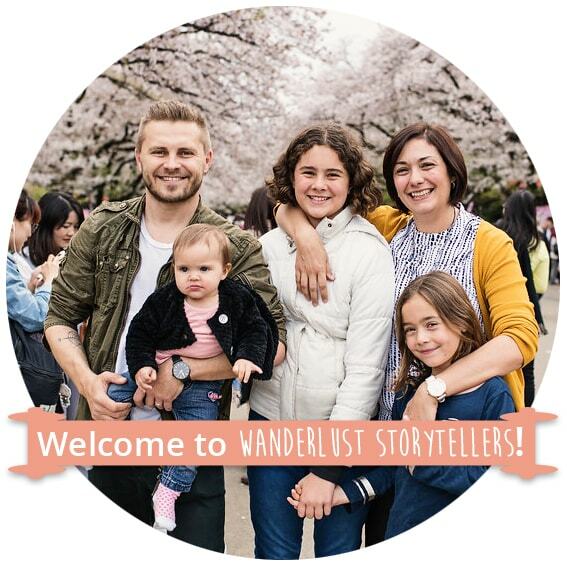 As always all the fun, adventure and opinions are our own! 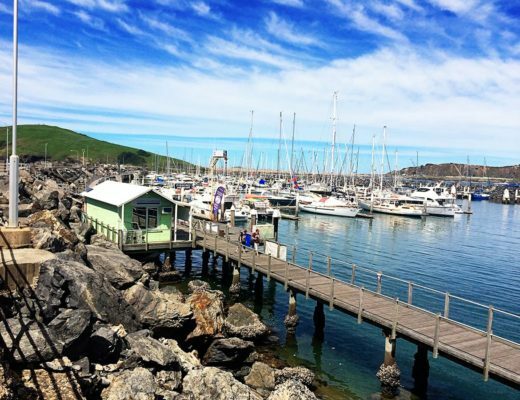 Top 5 Things to do in Coffs Harbour to make your stay Absolutely Perfect! 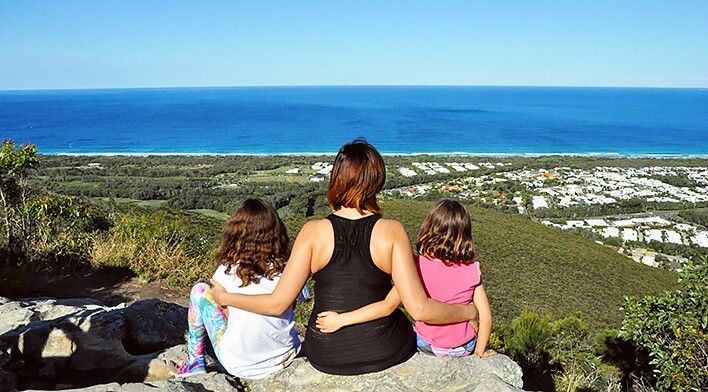 The Popular Mt Coolum Walk, with Glorious Views from the Summit! 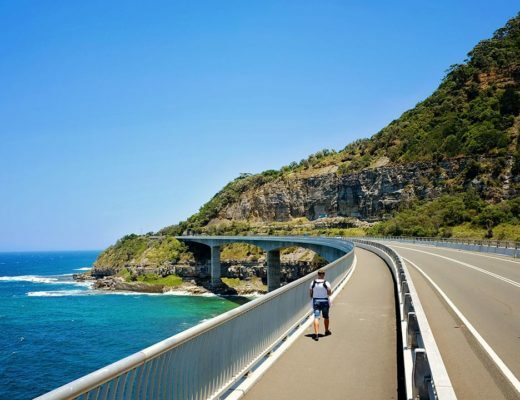 Sydney to Kiama Drive, Including the Glorious Sea Cliff Bridge Lookout!